Yesterday, after I'd been lying flat on my belly in a field for something like forty-five minutes, I was fully engulfed in the dilemma of the air-rifle rabbit hunter: Do I get up and move on to somewhere where there might be some damn rabbits, or do I stay here and capitalise on the fact of my recent immobility and the potential that this has for lulling rabbits - in theory at least, nearby rabbits - into the conclusion that all is placidly calm beyond the burrow and thus the ideal condition for some outdoors sunbathing and feeding? I was lying right next to a wire fence that had posts at eight-yard intervals and this was handy place to be since it gave me a fine way of reckoning the shooting range of any rabbit that did appear - but none had appeared and I was getting increasingly uncomfortable (as well as more and more aware of the pint of tea I'd drunk before setting out). Just then a rabbit popped into view, on the other side of the fence to me, at a startlingly close eight yards - certainly the closest I'd ever been to a wild rabbit. The tricky thing, I soon realised, was that, what with me lying so close to one side of the fence and the rabbit sitting equally close to the other side, looking almost straight down the line of the thick wire mesh as I was meant that there appeared to be an all-but-impenetrable metal sieve between myself and the peacefully nibbling animal. With all the stealth I could muster, I managed to shift the weight of the gun and bring the scope to my eye (moving so heavy a gun with my right arm at full stretch in front of me when I was lying flat on my stomach was in itself, quite difficult, but holding its eleven-pound weight up off the ground with one hand, when I'd done this, was enough to bring me out in a sweat). I'd left the scope focused at about 25 yards - this was the distance to the burrow that I thought, when I'd lain down, would be the most likely one for a rabbit to appear from - looking through it at a target eight yards away, however, I could only just manage, wrongly adjusted as it was, to wrench my eye so that it could focus on the the gaps in the wire and rabbit's head beyond. It looked like it might just be possible to get a shot through, but if I was to do this I'd need to turn the parallax adjustment ring so that I could focus on the rabbit and, so as to get the pellet cleanly through the wires, see the aiming reticule as well - since, as it was, I couldn't see the cross-hairs at all. Shifting my grip on the gun to hold it by the scope, I tried to turn the adjustment ring with one hand; these rings on Hawke scopes are quite notoriously stiff and my scope is a good example of this - with one hand I just couldn't budge it at all. I lay the gun down on the grass again - all the time trying to make these movements minutely slow so as to not startle the rabbit - and shifted, ever so gently, so that I could bring two hands to bear on the recalcitrant ring. This time, I could just manage to make it turn. 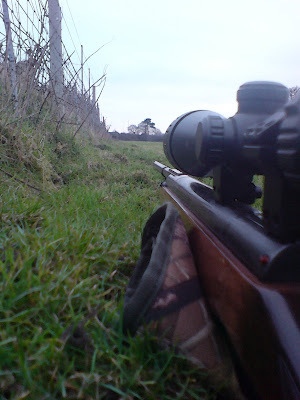 But when it turned, because a couple of weeks ago I'd managed to get a few grains of sand between the ring and the barrel of the scope, it made the tiniest scratching noise - and that was it, the rabbit was gone. Sounds like something that should be taken care of. Unscrew the ring in one direction, blast it with compressed air, screw it in the opposite direction, blast it again, and then lubricate the threads with graphite. Good old fashioned pencil lead will do. But no petro-chemical oils or lubes. They may attack the sealing o-rings in the tubes if they get to it. Sounds like your set-up was picture perfect though. I would try it again, in the same location. You could have gone with "Kentucky Windage" too, and ballparked the different point of impact if you're familiar with the ballistics of your air rifle over distances. I do that more often than I twist a ring on a scope. It's faster and quieter.